Online learning in Michigan, as delivered by Michigan Virtual and others, has exploded in recent years. This growth highlights the success that Michigan Virtual and others have had in promoting online learning across Michigan, yet underscores the work that still needs to be done. 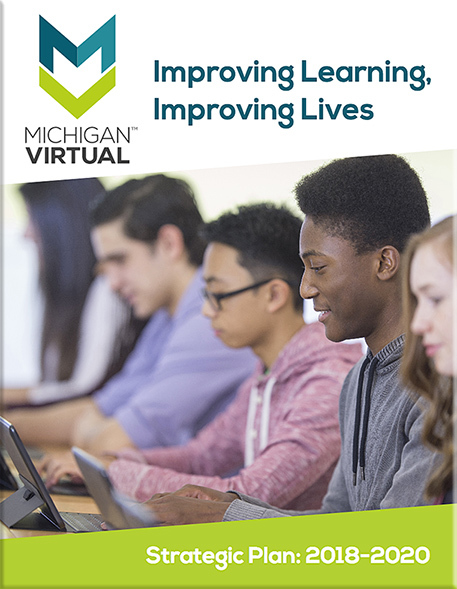 Thirty-seven percent of Michigan districts did not have a single student take a virtual class in 2015-16, and only 6% of all K-12 students in the state took a virtual course. The statewide completion rate for all virtual enrollments has dropped from 66% in 2010-11 to 58% in 2015-16. So while online course participation has increased, it is still a small share of the overall market. Further, educational outcomes have declined, leaving opportunity for improvements in quality and online learning program implementation. This, combined with statewide efforts to make Michigan a leading education state, provides new opportunities for Michigan Virtual to advance K-12 digital learning and teaching through research, practice, and partnerships. This strategic plan began with an extensive research and stakeholder outreach effort. This was designed to enhance our understanding of demographic and economic conditions, education policies and priorities, competitors and technology trends, stakeholder wants and needs, and views and perceptions of Michigan Virtual. We interviewed or surveyed more than 425 individual stakeholders, including Michigan Virtual teachers, staff, students, and board members; the leadership and membership of leading educational organizations such as the Education Alliance of Michigan, the Virtual School Leadership Alliance, MASA, MAISA, MEMPSA, MASSP; and other leaders in education across Michigan. We also consulted research and data on technology trends, K-12 enrollment projections, state and national economic forecasts, education policies and priorities, and the competitive landscape. It is expected that the Michigan economy will see modest growth in coming years. This will help state revenues remain relatively stable, but it is not expected that there will be significant growth in tax revenues available for increased spending on programs including K-12 education. The Michigan Department of Education’s Top 10 in 10 strategic plan was developed with input from a broad group of stakeholders and is expected to remain a guiding document, along with the state’s ESSA plan and the 21st Century Education Commission’s report “The Best Education System for Michigan’s Success,” in coming years. Education priorities at the federal level are not as clear, though we expect an expanded focus on choice and options for parents and their students. Technology infrastructure is built out to extend high-speed Internet access to the majority of schools and citizens in Michigan, though in-home access is still not fully available in some lower income or rural areas. Users of online programs and websites have come to expect instant access and user-friendly designs and interfaces that they can access on any device. There is growing acceptance and use of online courses across Michigan, though there remains a need to identify and demonstrate best practices, communicate benefits, and ensure quality standards are adopted to improve student outcomes. There is growing competition among online course providers, with many focusing on low-cost solutions that are appealing to budget-constrained schools, but that may not adhere to best practices and quality standards that are demonstrated to improve student outcomes. The false perception persists among some that Michigan Virtual is a for-profit organization that competes with traditional schools. The need for, and adoption of, online and blended professional development will increase as educators increasingly see the value of integrating digital resources into their traditional classrooms. While educators see the value of integrating digital resources into their traditional classrooms, many do not know how or where to start. Most schools and districts also lack the expertise to develop and implement blended learning programs on their own. Today’s digital-learning landscape could not have been predicted when Michigan Virtual was founded in 1998, or even when our last strategic plan was developed in 2014. Some areas of digital learning have been frustratingly slow to advance, while others have perhaps grown too quickly at the expense of effectiveness and student outcomes. This plan was intentionally designed with an unpredictable landscape in mind. The plan printed here is static, but the actions to implement the plan are dynamic. Tactics for each strategy and goal will be evaluated at least annually to stay aligned with ever-evolving challenges and opportunities. However, the goals, when taken together, provide a formula for success regardless of how the landscape evolves. We will provide an awesome experience for internal and external stakeholders alike, build partnerships to scale and grow our success, and operate efficiently and as good stewards of our resources to ensure our financial viability. Doing this, in alignment with our mission to advance K-12 digital learning and teaching through research, practice, and partnerships will bring us to a point where our vision (every person can use digital learning to reach his or her full potential) is a reality.